My cousins from Canada arrived yesterday. That made me busy last night, so I got no time for blogging. My cousin's busy using our computer to update his friends in Canada. It's their vacation till August so they're spending their time with us. This afternoon, we went to SM Batangas and hang around with them. We tried the 4D Max, and that's a lot of fun. We were shaken inside the cinema cause we chose that horror movie, yet we're all laughing inside. It's not that scary cause the movie's for children. Here's the link for our video. 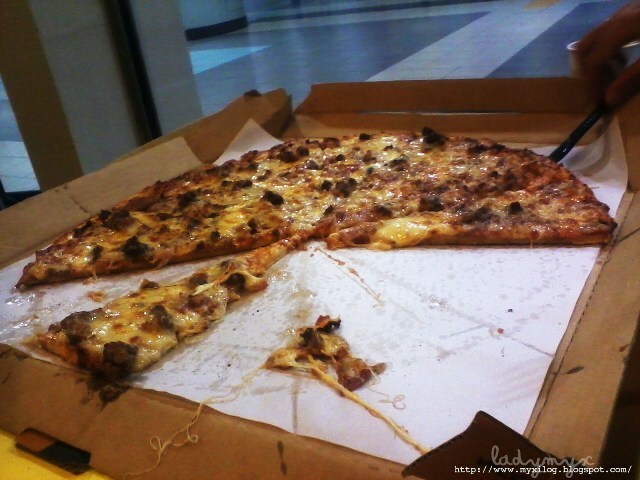 We took our dinner in our favorite Pizza House, Yellow Cab. It's suppose to be at Pizza Hut but there's a lot of people hanging around. We ordered for the Manhattan Meatlovers Pizza and a liter of soda. 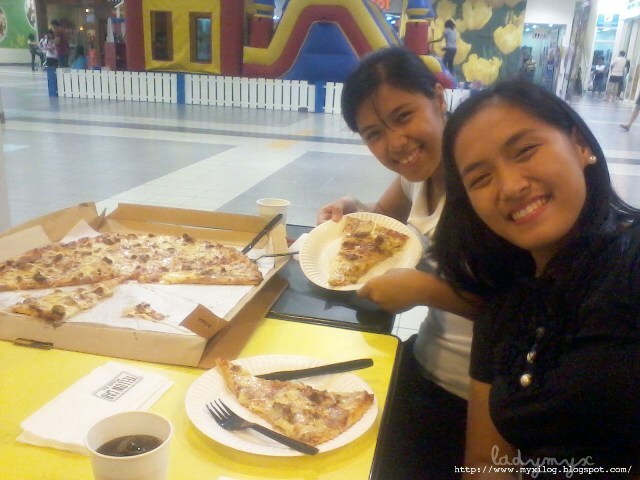 Me and my sister enjoying the pizza. 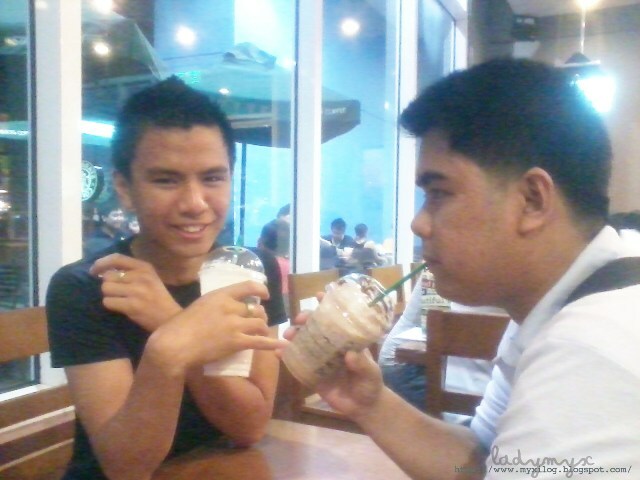 Alan (couz)and Kuya (brother) at Starbucks. 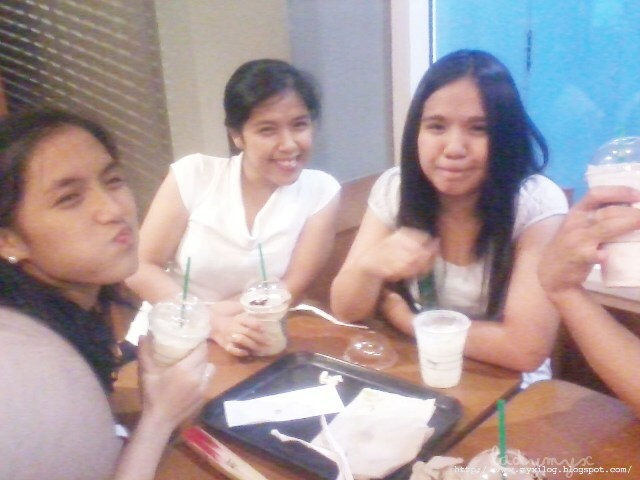 Ynna (sister), Me and Dyan (couz) at Starbucks. We really enjoyed the night with them. It's tiring though, yet we're all larky. We got home by 10pm. Then our house is filled with bunch of stuffs like clothes, gadgets and foods from them. It smells like Canada in here. My mom got a new laptop, and it's suppose to be mine. Haha. And tomorrow, it's going to be a busy day. Phew. I also wanna thank them for the Lays they bought for us. Yum yum! Photos are taken using my brother's Samsung Phone 's camera. wow i love pizze ..
btw i like pizza ..